This recent study from the Donskey group could provide hospital cleaning staff with a powerful visual cue to help assure adequate disinfectant coverage. The addition of a chemical widget to bleach solution gives it a bright blue hue when applied to surfaces, so allowing a cleaner to track their progress visually! 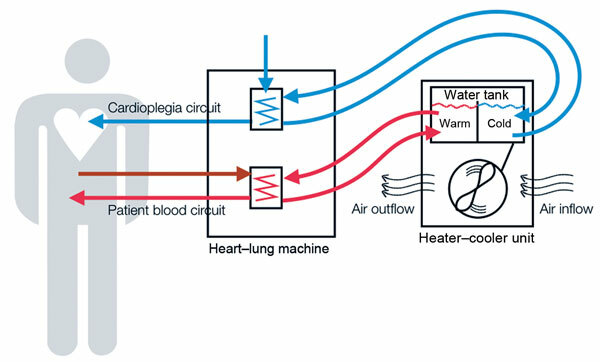 There has been much discussion about the risk of Mycobacterium chimaera infections associated with contaminated heater-cooler units (HCUs) used in cardiothoracic surgery. A study published recently in CID explores the risk in the UK, and provides further evidence to link these tricky-to-treat infections to contaminated HCUs. The use of PPE and the protection of HCWs against highly infectious diseases was (and is) a topic of major importance, around the globe. The recent Cochrane review by Verbeek et al. was probably hoping to offer this “vital” information. Active more than passive training in PPE use may reduce PPE and doffing errors. Their conclusions are obvious: we need high-quality studies of the materials, their use and protective effects, safe ways of doffing, and the most adequate training to achieve safe use of PPE for HCWs in the presence of highly infectious diseases or those (even less infectious) that may cause severe harm to HCWs. But what to do until than? My personal opinion is that we should only use PPE, we are used to and know how to use. First-time users, even if supplied with the best available products, will inevitably fail to remove the PPE without error. Consequently, institutions should have a stable selection of PPE, and in the case of preventing highly infectious diseases, a selected group of HCWs with continuous active training, as it is too late to start when the next epidemic is hitting our healthcare centers.